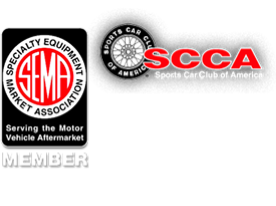 Performance Electronics, Ltd. was commissioned by Coltec, Inc. in conjunction with Cummins Engine Company and the U.S. Navy, to develop a custom engine control system for a revolutionary experimental engine. The rotary power plant’s novel combustion concept required custom software and hardware to control fuel delivery and spark ignition. Performance Electronics delivered the controller hardware and software plus engine hardware, system calibration and firmware update tools. COMPLETE ADJUSTABILITY – All system parameters adjust using a PC-based, custom monitoring program. FUEL CONTROL – The Electronic Control Unit (ECU), via direct injection, controls fueling based on various engine parameters and sophisticated analysis. IGNITION CONTROL – The ECU adjusts and controls ignition timing and dwell. ADDITIONAL CONTROL – Another unique feature of this system is the ability to “drive by wire”. The ECU electronically controls the throttle valve allowing its closed-loop operation as a function of other engine parameters. The fuel pump and several status indicators are similarly controlled by the ECU. TOTAL PACKAGE SOLUTION – Performance Electronics, Ltd. supplied the Total Engine Control Solution, which included the electronic control unit, wire harness, throttle body, air filter, ignition coil, relay box, programming tools and complete system manual. This is the single-cylinder engine control system. All of the electronics are sealed within the water-tight enclosure. This system was designed for a two stroke motorcycle engine. 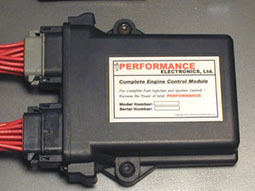 The ECU is small, lightweight, rugged and it controls all of the fueling and ignition responsibilities of the engine. This system had many of the same features as some of our standard engine control products. The benefits of adding an engine management system to a 2-stroke include: increased low and mid RPM torque due to better fuel and ignition control, improved all around drive-ability, reduced exhaust emissions.